When it comes to Social Security, we will slowly raise the retirement age….We will gradually increase the Medicare eligibility age by one month each year. solely by raising the retirement age and slowing the growth of benefits for “those with higher incomes,” I’d put my money on 70. Slowing benefit growth on high earners just doesn’t do enough to let you get away with anything less. So there you have it. If you’re in your 30s or 40s, Mitt Romney thinks you should work until you’re 70. That might be OK for bloggers and politicians, but I’m not sure how all the dockworkers and haircutters and grocery clerks are going to feel about that. Especially when you consider that life expectancy for these folks has gone up a paltry 1.3 years in the past three decades. 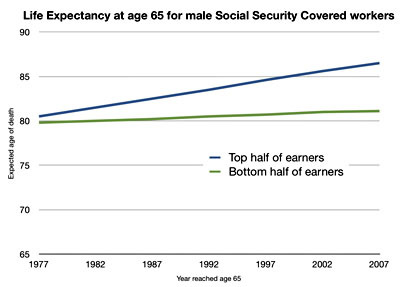 It’s the well-off who are living longer, not the lower half of the middle class.